They go on daring expeditions. Islands and bays have been named after them. Monuments have been raised in their memory. They are the heroes of many a legend. 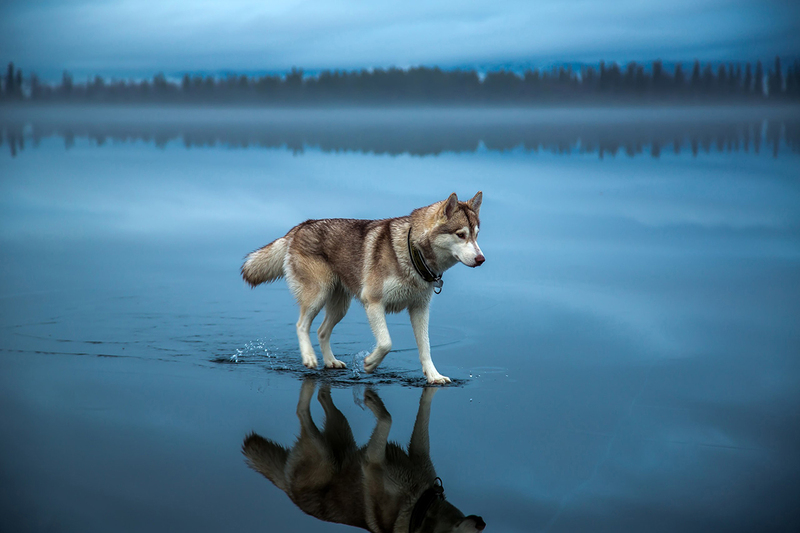 In the North, sled dogs are man's loyal companion: powerful and furry, strong and trustworthy friends. If you see a stocky, blue-eyed dog that howls instead of barking, and its tail doesn’t curl into a cute "ring" on its back, like that of a Laika, then it’s a Siberian Husky, the original working breed popular among the settled tribes of the Far East: the Yukaghirs, the Kereks, the Siberian Yupiks and the Chukchi. Husky is also an Instagram celebrity, the star of Moscow parks and Siberian dog sled races. All these huskies want is to run, run, run! In contrast to Laikas, who were used by the indigenous peoples for deer herding, Huskies are exclusively sled dogs, and they’re also the fastest. In 1925, their speed helped to stop an epidemic: Norwegian Leonhard Seppala and his team of Huskies delivered diphtheria vaccine to the Alaskan town of Nome, which was being ravaged by the disease. A joint effort by man and dog, this feat was dubbed the Great Race of Mercy and later was the subject of a Hollywood documentary titled Balto's Race to Nome. Today sled dogs are man's companion. People keep them in their homes, win sporting competitions with them, take them hunting, sled-riding and even explore Siberia with them. French traveler and writer Nicolas Vanier set out on his "Siberian Odyssey" with a multi-breed team of sled dogs, covering the distance from Lake Baikal to Moscow. Upturned corners of black lips resembling a smile, a coiled fluffy tail, thick white fur and a gentle personality – the cute Samoyed is a huge relative of the Spitz. This dog is hard to mistake for any other breed. For thousands of years it has been the companion of the Samodeic peoples, who had been called the Samoyeds until the beginning of the 20th century; quite naturally, their dogs were called Samoyed dogs. At present, their descendants – the Nenets, the Enets and the Nganasans – inhabit the Taimyr Peninsula. The indigenous peoples of the Russian North hardly ever used Samoyeds for transportation, because these dogs had better uses in the family: You could not wish for a more watchful deer herder or a more kindly babysitter. When the parents left for the tundra during the day, their children played with the dog, and at night, the Samoyeds were allowed to sleep in the chum, serving as furry pillows for the little kids who hugged them in their sleep to stay warm. In the 19th century, British zoologist Ernest Kilburn Scott, who had spent three months with the Samodeic tribes, brought three Samoyed dogs to England from Siberia, and so the breed was introduced to the West. Today the Samoyed is a popular breed all over the world. If you want to buy a Samoyed, keep in mind that they need to spend a lot of time with people because over three thousand years, "the snow dogs" have barely changed – they are the most sociable and the easiest to train of all the northern breeds, and playing with kids is their true vocation. A week without playing outside will send your Samoyed into a depression. The Sakhalin dog, the Gilyak sled dog, or the Karafuto-Ken, as the Japanese call them, – these are the names of a near-extinct breed also known as the Sakhalin Husky. These ancient sled dogs once served the Nivkh people, or Gilyaks – a small tribe that used to inhabit the Amur River basin and the Island of Sakhalin. Those big paws that let them run on the snow without sinking into it, along with their intellect and stamina, made these dogs irreplaceable in the life of the Far Eastern tribes. A sled pulled by a team of Sakhalin Huskies was a common means of winter transport on Sakhalin. Fish, frozen milk, bundles with mail, passengers – 30-dog teams steered by mushers pulled anything and everything, fighting their way through blizzards or making their way between ice ridges. In the 1930s, these robust and even-tempered dogs, which easily learned their masters' orders, were used in the Soviet Army. However, Soviet officials calculated that feeding the dogs with salmon jerky, their traditional food, was too extravagant for the state and decided to exterminate the dogs. As a result, the breed was on the brink of extinction on Sakhalin. By the 1950s, a few Sakhalin Huskies had survived in Japan, where they were to become a national legend. In 1958, Japanese researchers launched an Antarctic expedition and took a few Karafuto-Kens with them. Caught in a severe snowstorm, the expedition team was forced to evacuate, leaving 15 sled dogs in Antarctica. The researchers planned to rescue the animals later, but the weather did not allow it. When the Japanese finally reached Antarctica a year later to bury the dogs' bodies, it turned out that two of them, Taro and Jiro, had survived miraculously. In Japan, these Sakhalin Huskies became national heroes: They were memorialized in a monument and then were the subject of a film titled Antarctica, which was later remade in the USA under the title Eight Below. On northern expeditions during the first half of the 20th century, dogsleds were the primary means of transport for Russian explorers. The harsh conditions placed a special emphasis on the relationship between man and his dogs. Polar explorer Georgy Ushakov and a pack of 50 Laikas set out on an expedition which resulted in the discovery of Severnaya Zemlya, a new island which was added to the map of the world in 1930. Ushakov's expedition team hunted white bears, seals and ringed seals to provide the dogs with fresh meat, sewed special boots for their paws and dug holes in the snow for the dogs to spend the night in, and in return, the dogs were ready to walk thousands of miles for their masters. Two years in the Arctic, work every day in the tundra and that never-ending polar night – only Laikas with their well-balanced personality, Nordic temperament and simple nutritional needs could survive the austerity of a polar expedition.